Cx Associates supported the project by acting as commissioning agents as well as performing project engineering of the control sequences. Our work also included developing specifications and sequences of operation, verifying performance of the new equipment in the field, and estimating the energy savings for use by the local utility to facilitate a significant rebate for the project. 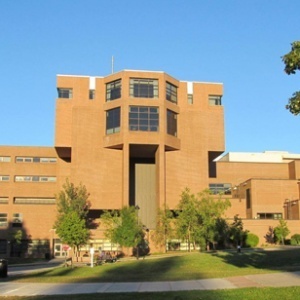 Cx Associates completed a comprehensive and highly successful upgrade to UVMMC’s McClure HVAC system that resulted in energy savings of over $100,000/year for the facility. This project also increased the effectiveness of the building operations team by giving them the tools they need to efficiently operate this complex system. In addition, the system will experience significantly less downtime for repairs and maintenance costs in the future. Cx Associates supported the project by acting as commissioning agents as well as performing project engineering of the control sequences. Our work also included developing specifications and sequences of operation, verifying performance of the new equipment in the field, and estimating the energy savings for use by the local utility to facilitate a significant rebate for the project. The goal for this project was to modernize the McClure AHU controls system to allow for true automatic operation with minimal intervention by facilities staff while maintaining the level of comfort and amenity expected in the facility. This project was also expected to result in energy savings for the system. The project included a complete upgrade to the controls system, improved controls programming to capture energy savings, and elimination of failed system elements to improve function and operation. Return On Investment – The total project cost was slightly over $600,000. Cx Associates helped facilitate utility rebates that amounted to roughly $200,000, making the net cost $400,000 to the hospital. The annual energy savings of approximately $165,000 yields an impressive 41% ROI. After just over two years the project will have paid for itself and the annual savings will continue to be realized. Simplified Maintenance – The McClure AHU now operates with minimal operator intervention. Before this project, significant effort was required to monitor and adjust the AHU to ensure the building remained satisfied. This major enhancement will allow operations staff to shift their focus towards other important preventative maintenance measures within the facility. Preemptive Programming Logic Review – The controls contractor, Cx Associates, and the project’s PM performed a day-long review of the control programming code and conducted partial, off line functional testing. Due to the 24/7 nature of the AHU’s operation, there was little opportunity for in-field modifications to the programming. This preview offered the team the opportunity to dig deeper into the programming, and adjust and evaluate the controls before they took over the AHU. Building Analytics – A building analytics software package was implemented to provide real time feedback to building operators on the “health” of the energy consuming portions of the system. Data Management – The project’s energy baseline consisted of over 180,000 data points. Cx Associates developed a meaningful, understandable baseline that the local utility can use when this project’s savings claims are audited. In addition, after conducting detailed savings calculations and performing a rigorous field verification of the hardware and software, Cx Associates was able to provide the utility with a high level of confidence that the energy savings were real and would persist over time. This enabled the utility to commit to a substantial rebate. System Improvements at Functional Testing – During Functional Testing, modifications to the fan speed ramp up times at startup were implemented that will eliminate the freeze protection trips that constantly plagued the system before. The need for these changes could not have been recognized without systematic, on site functional testing. The operation of this air handler is highly complex and critical to the safety and comfort of the McClure building occupants and patients. The project team worked together closely from inception through turnover resulting in a tightly coordinated project that met the needs of the hospital while allowing for nearly seamless implementation. The dynamic design process, collaborative nature of the project team and the inclusion of key hospital staff at the appropriate times all contributed to the success of the project. 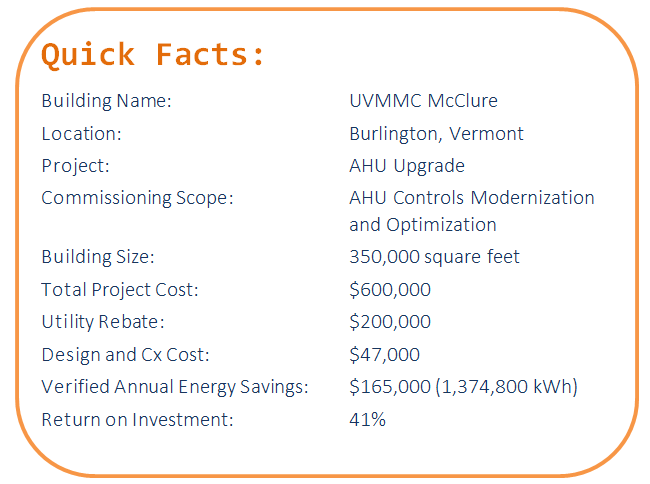 The modernization of the McClure AHU controls will allow for much more predictable performance, more reliable operation and persistent, significant energy savings for the hospital.